Originally produced for a museum in the UK. The Royal Americans were formed in 1756 after Braddocks defeat and were specifically formed with a view to fighting in the Americas and Canada. Officer recruitment was mainly from Switzerland and Germany, it was the first time foreigners had been allowed an officers commission in the British army. The 60th were trained to fight as a conventional infantry unit but also as a more irregular force that could fight in the heavily wooded areas of North America against the French and the Native Indians. The Regiment fought at Louisbourg, Quebec and Bushy run plus it maintained garrisons throughout the continent during the FIW. Our first figure from this series is dressed as he would have been for the FIW and is stood to attention, useful for either on parade, guard or waiting to go into battle. 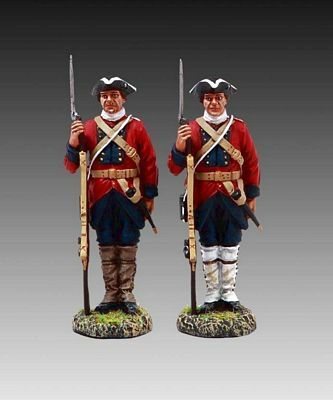 All the figures in this series are slightly smaller than our normal 60mm range and will fit in nicely with Britain’s, JJD or Frontline figures from this period. Released March 2014. Limited to 100 pieces.